Talon Security Ltd was established in April 2011 and was initially involved with door supervision in the Newry area. From the outset, the main criteria of Talon Security Ltd was to offer fully licensed, polite and experienced door supervisors. Along with these parameters, focus was also on presentation of staff, and hence smart, presentable uniforms were introduced. 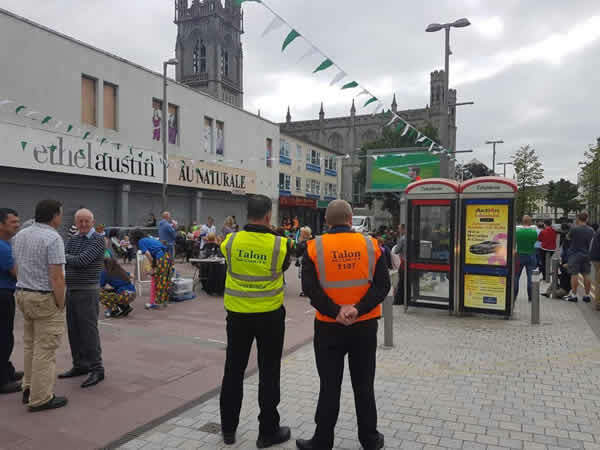 Within a short period of time Talon Security were supplying staff to such prestigious venues as The Canal Court Hotel and The Carrickdale Hotel. Some events for Newry & Mourne D.C. were also catered for. Since then Talon Security Ltd. have grown, and now supply a range of security services such as Manned Guarding, Retail Security, Mobile Patrols, Response Vehicles, Dog Units, CCTV Installation, Access Control and 24 hour CCTV Monitoring. Talon Security have implemented a number of accreditation's including ISO 9001, Constructionline, N.A.S.D.U. and have just received the prestigious SIA Approved Contractor Scheme in Door Supervision, Security Guarding and Key Holding. They are also an approved Highfields test centre. These advances hopefully assure current customers and future customers of their dedication to providing a quality service at all times.